When relocating, it is not surprising to have failed to plan ahead about the actual problems associated with moving. We understand your preoccupation with finding a new residence, arranging for your children’s education and the hundreds of other hassles of moving. Roadways Removals is always on the road helping families and businesses move interstate. From Logan to Adelaide, we can help you move to any major town in Australia. If you have flexible moving dates you can even take advantage of our backloading interstate furniture removals. From small moves (under 5 items) to moving your entire house (including that kitchen sink and baby grand piano) we can tailor an interstate furniture removal service to your needs and budget. Start with an online quote or call us on 1300 799 902 for more information. Roadways Removals provides a comprehensive door-to-door Logan to Adelaide Removalists service that includes pre-packing, loading, transport, delivery and even unpacking. 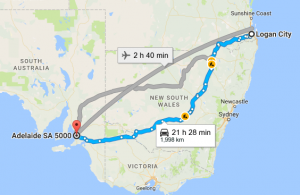 Roadways Furniture Removals oversees the most extensive relocation network in Australia, if there is a destination, it is on our map! Make your interstate removals easy and Contact Roadways Removals today. We offer a complete array of interstate moving services that are personalized to your requirements to guarantee you get precisely what you pay for.